Although iPhone 3GS has a commendable 3.2 megapixel camera, but apart from very basic camera functionality, you can hardly do anything special with it. But then as they says that there is an app for just about anything on the iPhone, so is the case with this app as well. A new app by the name of Security Cam has just been approved which enables iPhone users to use their iPhone as security (or should I say spy?) camera. With this app, you can set your iPhone to take pictures at a pre-defined set of interval in minutes, or just about every time the mic on the iPhone detects any sound. You can also set the app to run the two modes in question simultaneously to take pictures every minute and/or whenever it picks up some sound. Security Cam app was first submitted to Apple back in December 2008, where it remained in review for quite a long before getting finally approved earlier this week. Taking over a year to approve this application is obvious due to privacy issues as apps of this nature could be misused for invading others privacy. Features of Security Cam app for iPhone are as follows. Frequency Capture: Set a specific frequency for when the camera will take a photo. A Countdown is shown on screen. Audio Trigger: The camera will only snap a photo when a predefined noise level is detected. Frequency and Audio: There is an additional feature that allows the application to choose both frequency capture and audio trigger so as to never miss an important shot. Time & Date Stamp: Attach an optional date and time stamp to allow going back and see what happened and when. Battery Conservation: Set a specific time for the operation. The iPhone will then go to sleep after the defined period is over to save on battery. Don’t forget to check out our iPhone Apps Gallery to explore more apps for your iPhone or iPod touch. what a waste. this is useless do to the fact you have to leave your phone to such a thing. 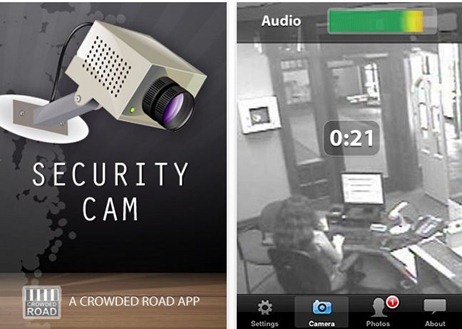 if you want to have security get icam from the app store and utilize your web cams set up wherever, up to four cams. I'm betting it's costing Apple quite a bit of money to replace iPods that irresponsible people are trying to game them for. I'm surprised it's taken Apple this long, frankly, and I don't blame them for it. Yeah, neat concept, but you have to leave your phone.